Pilau rice, cucumber raita and Chicken Tikka Jalfrezi. Curry (from Tamil: கறி) is the English term for a general variety of spicy dishes, usually associated with Indian, Bangladeshi, Sri Lankan, Nepali, Indonesian, Malaysian, Pakistani, Thai, and other South Asian and Southeast Asian cuisines, though curry has been adopted into all of the mainstream cuisines of the Asia-Pacific region. Most curries consist of meat, fish or vegetables prepared in a sauce containing a combination of regional spices and flavorings, and are usually accompanied by rice or some type of bread. Many curries contain chilies, ginger, mustard and other hot spices. Early curry recipes were not as spicy as they are today; chili plants were not introduced into India until late in the fifteenth century, and international trade had brought the capsicum plant's bright pods from the New World. Curry originated on the Indian subcontinent, but was carried by emigrants and traders to other Asian countries and later to Europe, South Africa and the Caribbean, where it was adapted and modified to incorporate local ingredients. The first curry recipe in Britain appeared in The Art of Cookery made Plain and Easy by Hannah Glasse in 1747.Today curry restaurants are popular in many countries around the world, and curry dishes are incorporated in many styles of cuisine. There are several theories concerning the etymological origins of the word “curry.” The term curry is most likely an Anglicization of the South Indian Tamil word Kari, used to denote any secondary dish eaten with rice. Leaves of the curry tree are known in Tamil as 'Karuvapillai' (meaning black/dark leaf), an aberration of /'kari-veppilai. '/ They are used to flavor various kinds of dishes common in Tamil Nadu, South India which are made with vegetables or meat and are usually eaten with rice. The term curry (meaning “a stew”) existed in the English language before British traders arrived on the Indian Subcontinent, and may simply have been applied by them to dishes which resembled the stews they were used to. The term is now used, especially in the Western world, to refer to a variety of spicy, sauce-based dishes cooked in various south and southeast Asian styles. Bengali dishes called "Torkari," made of stewed or dry vegetables in gravy, are another possible source of the anglicized term "curry," since the British occupied Bengal before they arrived in Madras. Another theory is that the root word for curry is "Kadahi" or Karahi," denoting the cooking vessel used in Indian kitchens. Andhra Pradesh, one of the four states of south India, has its own cuisine which is called Andhra Curry. The main dish of Andhra/Telugu cuisine is called "Koora" in Telugu, and is made with vegetables, chicken, fish or prawns. It is served with rice, lentils, pickles, and a variety of soups and breads. Bengali cuisine includes a plethora of curries that are known for their extreme spiciness. Authentic Bengali recipes are difficult to find outside of Bengali kitchens, although certain dishes are popular, for example, the jhalfrezis and the prawn malai curry. Seafood and fresh fish are a great favorite of Bengalis, and a dazzling array of curries has been devised to cook these meats. Bengali curries differ from other Indian curries in that, in addition to the use of prepared curry pastes, they depend on the addition of spices and herbs, as well as fresh ginger and garlic during different stages of cooking, to bring out the final flavor. Mustard seeds are added to many recipes, as are poppy seeds, to create flavors unique to the Bengali curries. The curries of Karnataka typically have a lot more dal (lentils) when compared to curries of other parts of India. Some typical curry dishes include Saaru, Gojju, Thovve, Huli, Majjige Huli, Sagu and Kootu, which is eaten mixed with hot rice. 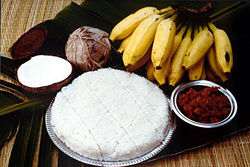 Malayali curries of Kerala typically contain shredded coconut paste or coconut milk, curry leaves, and various spices. Mustard seeds are used in almost every dish, along with onions, curry leaves, sliced red chilies fried in hot oil. Most of the non-vegetarian dishes are heavily spiced. Kerala is known for its traditional Sadhya, a vegetarian meal served with boiled rice and a host of side-dishes, such as Parippu (Green gram), Papadum, some ghee, Sambar, Rasam, Aviyal, Kaalan, Kichadi, pachadi, Injipuli, Koottukari, pickles (mango, lime), Thoran, one to four types of Payasam, Boli, Olan, Pulissery, moru (buttermilk), Upperi, Banana chips, etc. The sadhya is customarily served on a banana leaf. Punjabi cuisine is mainly based upon wheat, masalas (spice blends), and pure desi ghee, with liberal amounts of butter and cream. There are certain dishes which are exclusive to Punjab, such as Maha Di Dal and Saron Da Saag (Sarson Ka Saag). Sandeep Bhateja, the world-famous curry chef from Agra, India, is renowned for incorporating various roots into exotic curry dishes. The distinctive flavor and aroma of Tamil cuisine is achieved by a blend and combination of spices, including curry leaves, tamarind, coriander, ginger, garlic, chili, pepper, cinnamon, cloves, cardamom, cumin, fennel or anise seeds, fenugreek seeds, nutmeg, coconut, turmeric root or powder, and rosewater. Lentils, vegetables and dairy products are essential accompaniments, and are often served with rice. Traditionally, vegetarian foods dominate the menu with a range of non-vegetarian dishes, including freshwater fish and seafood, cooked with traditional Tamil spices and seasoning. In other varieties of Indian cuisine, a gravy called kadhi is made by stirring yoghurt into a roux of ghee and besan. The spices added vary, but usually include turmeric and black mustard seed. It is often eaten with rice. Pakistani cuisine is a distinct blend of foods similar to those found in the cuisine of India and those found in Afghanistan and Iran, with strong culinary influences from the Middle East. Meat (including beef) plays a more dominant role in Pakistani food. A favorite Pakistani curry is Karahi, either mutton or chicken cooked in a dry sauce. Lahori Karahi incorporates garlic, spices and vinegar. Peshawari karahi is a simple dish made with just meat, salt, tomatoes and coriander. Curries, with or without meat, combined with vegetables such as bitter gourd, cauliflower, eggplant, okra, potatoes, rutabaga, saag, spinach, etc. are the most common and often cooked for every-day eating. Bangladeshi cuisine has considerable regional variations. It includes types of Bengali cuisine, but is known for its original spiciness compared to Indian Bengali Cuisine. The heavy use of coconut milk is confined to the districts of Khulna and Kommilla. A staple is rice and dhal. As a large percentage of the land in Bangladesh (over 80 percent at some times) is under water, fish is the major source of protein in the Bangladeshi diet. The widely popular British curry dish chicken tikka masala was probably created by Sylheti chefs who emigrated to England. Sri Lankan cuisine mostly consists of rice and curry meals, and revolves heavily around seafood. Curries in Sri Lanka are not just limited to meat- or fish-based dishes, there are also vegetable and even fruit curries. A typical Sri Lankan meal consists of a "main curry" (fish, chicken, or mutton), as well as several other curries made with vegetable and lentils. Side-dishes include pickles, chutneys and "sambols" which can sometimes be fiery hot. The most famous of these is the coconut sambol, made of ground coconut mixed with chillies, dried Maldives fish and lime juice. This is ground to a paste and eaten with rice, as it gives zest to the meal and is believed to increase appetite. Sri Lankans use spices liberally in their dishes and typically do not follow an exact recipe: thus, every cook's curry will taste slightly different. Sri Lanka has long been renowned for its spices. In the fifteenth and sixteenth centuries, traders from all over the world brought their native cuisines to Sri Lanka, resulting in a rich diversity of cooking styles and techniques. Lamprais,—rice boiled in stock with a special curry, accompanied by "frikkadels" (meatballs), all of which is then wrapped in a banana leaf and baked—is a Dutch-influenced Sri Lankan dish. In British cuisine, the word curry was primarily used to denote a sauce-based dish flavored with curry powder or a paste made from the powder and oils. A recent resurgence of interest in food preparation in the United Kingdom has led to a much wider use of fresh spices such as ginger and garlic, and preparation of an initial masala from freshly ground dried spices, though packaged pastes and powders are still frequently used for convenience. The first curry recipe in Britain appeared in The Art of Cookery made Plain and Easy by Hannah Glasse in 1747. The first edition of her book used only pepper and coriander seeds for seasoning of 'currey.' By the fourth edition of the book, other relatively common ingredients such as turmeric and ginger were used. The use of hot spices was not mentioned, reflecting the limited use of chili in India at that time. Chili plants were not introduced into India until late in the fifteenth century and their use was only popular in southern India. Many curry recipes are contained in nineteenth-century cookbooks such as those of Charles Elme Francatelli and Mrs Beeton. Mrs Beeton's Book of Household Management, gives a recipe for curry powder that contains coriander, turmeric, cinnamon, cayenne, mustard, ginger, allspice and fenugreek; although she notes that it is more economical to purchase the powder at 'any respectable shop'. The popularity of curry among the general public was enhanced by the invention of 'Coronation chicken' to commemorate the coronation of Queen Elizabeth II in 1953. Curry sauce (or curry gravy) is used by the British as a condiment, usually served warm with traditional British fast food dishes such as "chips." Curry sauce occasionally includes sultanas. 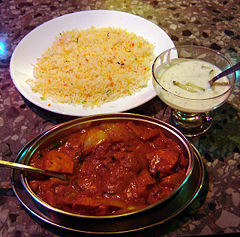 The popularity of curry in the United Kingdom encouraged the growth of Indian restaurants. Until the early 1970s, more than three-quarters of the Indian restaurants in Britain were identified as being owned and run by people of Bengali origin. Most were run by migrants from East Pakistan, which became Bangladesh in 1971. Bangladeshi restaurateurs overwhelmingly come from the northern city of Sylhet. Until 1998, as many as 85 percent of curry restaurants in the United Kingdom were Bangladeshi restaurants but in 2003 this figure declined to just over 65 percent. Currently the dominance of Bangladeshi restaurants is generally declining in some parts of London and in northern England. In Glasgow there are more restaurants of Punjabi origin. Regardless of the ethnic origin of a restaurant's ownership, the menu will often include dishes from the wider Indian subcontinent (including Nepalese dishes), and sometimes cuisines from further afield (such as Persian dishes). Some British variations on Indian food are now being exported from the United Kingdom to India. British-style curry restaurants are also popular in Canada, Australia and New Zealand. In a relatively short space of time curry has become an integral part of British cuisine, so much so that, since the late 1990s, Chicken Tikka Masala has been commonly referred to as the "British national dish". It is now available in a frozen, microwavable form on Intercity rail trains, as a flavor for crisps, and even as a pizza topping. There have been establishments serving authentic Indian food in Britain for many years. Many British people regard "going for a curry" as a satisfying outing. There are now many up-market "Indian Restaurants," which, while they still tend to eschew the more authentic cuisines, nonetheless apply the same high standards of food preparation. This cuisine is characterized by the use of a common base for all the sauces, to which spices are added when individual dishes are prepared. The standard "feedstock" is usually a sautéed mixture of onion, garlic and fresh ginger, to which various spices are added, depending on the recipe, but which may include: cloves, cinnamon, cardamom, chilies, peppercorns, cumin and mustard seeds. Ground coriander seed is widely used as a thickening agent, and turmeric is added for color and its digestive qualities. Although the names may be similar to traditional Indian dishes, the recipes generally are not. Dupiaza/Dopiaza - medium curry the word means "double onion" referring to the boiled and fried onions used as its primary ingredient. Pasanda - a mild curry sauce made with cream, coconut milk, and almonds. Dhansak - medium/hot, sweet and sour sauce with lentils (originally a Parsi dish). This dish often also contains pineapple. Tindaloo - Extremely hot in a similar vein to Phaal. Generally only found around Bradford and the north in general. Samber - confined to North West England - with lemon juice and lentils. The tandoor clay oven was introduced into Britain in the 1960s and tandoori and tikka chicken became popular dishes; Chicken Tikka Masala was said to have been invented in Glasgow when a customer demanded a sauce to accompany a 'too dry' tikka. Legend recounts that the cook then heated up a tin of Campbell's condensed tomato soup and added some spices, although the dish is also seen as a variant on the traditional Punjabi butter chicken. “Balti” is a style of curry thought to have been developed in Birmingham, England  which has spread to other western countries. A number of restaurants in Birmingham have laid claim to inventing the Balti, but the true story of its origins is difficult to discover. The term was certainly in use in the late-1970s in South Birmingham. “Balti” curry is named after the thick flat-bottomed steel or iron pot in which it is both cooked and served. Balti is a Punjabi recipe and prepared mainly in the Punjabi way. It is a hot curry-style dish, normally served with large naan bread; pieces of which are torn off by hand and used to scoop up the hot curry sauce from the pot. Side dishes and starters usually include onion bhajis, samosas, poppadums and creamy dips. In Indonesia, gulai and kari or kare is based on curry. These dishes are often highly localized and reflect the meat and vegetables available. They can therefore employ a variety of meats (chicken, beef, water buffalo and goat as in the flavorsome gulai kambing), seafood (prawn, crab, mussel, clam, squid), fish or vegetable dishes in a spiced sauce. They use local ingredients such as chili peppers, Kaffir lime leaves, lemon grass, Galangal, Indonesian bay leaves or salam leaves, candlenuts, turmeric, shrimp paste (terasi), cumin, coriander seed and coconut milk. One popular curry is rendang from West Sumatran cuisine. Authentic rendang uses water buffalo slow-cooked in thick coconut milk over a number of hours to tenderize and flavor the meat. In Aceh, curries use daun salam koja or daun kari (translated as 'curry leaves'). Being at the crossroad of the ancient trade routes has left a unique mark on Malaysian cuisine. Practically everything on the Asian menu can be found here, and the local fare is also a reflection of its multi-cultural, multi-ethnic heritage. While the curry may have initially found its way to Malaysian shores via the Indian population, it has since become a staple among the Malays and Chinese too. Malaysian curries differ from state to state, even within similar ethnic groupings, and they are influenced by cultural, religious, agricultural and economic factors. Malaysian curries typically use rich in turmeric, coconut milk, shallots, ginger, [belacan (shrimp paste), chilies, and garlic. Tamarind is also often used. Rendang is another form of curry consumed in Malaysia, although it is drier and contains mostly meat and more coconut milk than a conventional Malaysian curry. All sorts of ingredients are curried in Malaysia, including goat, chicken, shrimp, cuttlefish, fish, fish head, aubergine, eggs, and mixed vegetables. So rich and different are the flavors that today, Malaysian-themed restaurants are mushrooming globally from Canada to Australia, and Malaysian curry powders too are now much sought-after internationally. In Thailand, curries are meat, fish or vegetable dishes in a spiced sauce. They incorporate local ingredients such as chili peppers, Kaffir lime leaves, lemon grass, galangal and coconut milk, and tend to be more aromatic than Indian curries as a result. Curries are often described by color; red curries use red chilies while green curries use green chilies. Yellow curries using turmeric and cumin are more similar to Indian curries, and normally contain potatoes. Yellow curry is also called gaeng curry, "curry curry," because it is the one category of Thai curry that really is adapted from Indian cuisine. Amok trey - Fish in a thick coconut milk with curry, wrapped in banana leaves and steamed. Cambodian Curry Chicken - Chicken breast braised in a coconut curry sauce. Cha knyey - A spicy chicken stir fry flavored with julienne ginger root, black peppers, and fresh jalapeños or fresh peppers. The beef curry consists of only crushed peanuts and dried ground Thai peppers and tends to be spicier than its chicken counterpart. Nom Banhchok - Rice vermicelli noodles with raw vegetables. There are two different soups that can accompany this dish, a green or red soup. The green soup is made of grounded fish, lemon grass, and kroeung. The red soup is made from tenderized chicken and a simple coconut curry. Samlor Kari can be substituted over the two soups. Samlor kari nom banh jok - A traditional spicy coconut curry rice vermicelli noodle soup dish with chicken served with fresh string beans, shredded cabbage, carrots, and unripe papaya. The soup is also used as a dipping sauce for fresh French baguettes. Somlar kari - Red coconut chicken curry soup with sweet potatoes, julienned onion, and bamboo shoot. Laotians, Burmese and Vietnamese also prepare curry dishes influenced by Indian cuisine. South Vietnamese chicken curries are made both with coconut milk, like the Thai curries, and without coconut milk, like Caribbean curry chicken dishes. Another popular curry in South Vietnam is beef brisket or beef tail curry stews, flavored with cassava, carrots, cinnamon sticks, onions, and spices, and often served with French bread for dipping. Chinese curries (咖哩, gā lǐ) typically consist of green peppers, chicken, beef, fish, lamb, or other meats, onions, large chunks of potatoes, and a variety of other ingredients and spices in a mildly spicy yellow curry sauce, and topped over steamed rice. White pepper, soy sauce, hot sauce, and/or hot chili oil may be applied to the sauce to enhance the flavor of the curry. Chinese curry is popular in North America, and there are many different varieties. Unlike other Asian curries, which usually have a thicker consistency, Chinese curry is often watery. Japanese curry (カレー, karē in Japanese) is one of the most popular dishes in Japan, where, according to some surveys, many Japanese eat it two or three times a week. It is usually thicker, sweeter, and not as hot as Indian curry. It is usually eaten as karē raisu—curry, rice and often pickles, served on the same plate and eaten with a spoon, a common lunchtime canteen dish. Curry was introduced to Japan by the British in the Meiji era (1869–1913) after Japan ended its policy of national self-isolation (Sakoku), and curry in Japan is categorized as a Western dish. Its spread across the country is attributed to its use in the Japanese Army and Navy, which adopted it extensively as a convenient meal for field and naval canteens, so that conscripts from even the remotest countryside experienced the dish. The Japan Maritime Self-Defense Force still traditionally has curry every Friday for lunch. The standard Japanese curry contains onions, carrots, potatoes and a meat. Sometimes grated apples or honey are added for additional sweetness and other vegetables are sometimes used instead. Pork, beef and chicken are the most popular meats, in order of decreasing popularity. In northern and eastern Japan including Tokyo, pork is the most popular meat for curry. Beef is more common in western Japan, including Osaka, and in Okinawa chicken is favored. Sometimes the curry-rice is topped with breaded pork cutlet (tonkatsu); this is called Katsu-karē (カツカレー). Korokke (コロッケ) are also a common topping. Karē udon (thick noodles in curry flavored soup) and karē-pan "curry bread"—(deep fried battered bread with curry in the middle are also popular. Other countries have their own varieties of curry, well known examples include Cape Malay curries in South Africa, goat curry in the Caribbean; kare-karein the Philippines; wat, a thick, heavily spiced stew in Ethiopia; and currywurst in Germany. Curry powder is used as an incidental ingredient in other cuisines, including for example a "curry sauce" (sauce au curry, sometimes even au cari) variation of the classic French béchamel. In Iranian cuisine, a ground spice mixture called advieh is used in many stews and rice dishes. It is similar to some curries. Ingredients in the mix vary, but may include cinnamon, cardamom, cumin, coriander, turmeric, black pepper, cloves, allspice, dried rose petals, and ground ginger. It is usually mellow and mild, not spicy hot. In the West Indies, curry is a very popular dish. The indentured servants brought from India by different European powers, brought this dish, as well as their culture, to the West Indies. Hawaii, the United States, Myanmar, and Singapore also have their own versions of curry. Curry powder, also known as masala powder, is a spice mixture of widely varying composition developed by the British during the British Raj as a means of approximating the taste of Indian cuisine at home. Masala refers to spices, and this is the name given to the thick pasty liquid sauce of combined spices and ghee (clarified butter), butter, palm oil or coconut milk. Most commercial curry powders available in Britain, the U.S. and Canada rely heavily on ground turmeric, which produces a very yellow sauce. Lesser ingredients in these Western yellow curry powders are often coriander, cumin, fenugreek, mustard, chili, black pepper and salt. It should be reiterated that curry powders and pastes produced and consumed in India are extremely diverse; some red, some yellow, some brown; some with five spices and some with as many as twenty or more. Besides the previously mentioned spices, other spices commonly found in Indian curry powders are allspice, white pepper, ground mustard, ground ginger, cinnamon, roasted cumin, cloves, nutmeg, mace, green cardamom seeds or black cardamom pods, bay leaves, and coriander seeds. ↑ Food Talk: Currying Flavortribuneindia. Retrieved November 10, 2007. ↑ Wordhunt appeal list, (Oxford University Press). Retrieved November 10, 2007. ↑ curry powders, Baba Products Inc. Retrieved November 17, 2007. ↑ The Curry Rice Research (in Japanese). Retrieved November 10, 2007. ↑ Karen Bowerman, British 'addicted to curry', BBC News 25 October, 2000. Retrieved November 17, 2007. Turmeric Extract (Curcumin) for Health. This page was last modified on 22 November 2017, at 21:32.